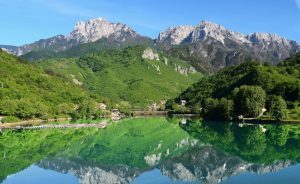 The municipality of Jablanica has very good natural conditions for the development of tourism, especially Jablanica and Grabovica lakes, mountains Prenj and Cvrsnica, and rivers Neretva, Doljanka, and Sanica. Rivers Doljanka and Sanica are very interesting for sports fishing and camping in nature, and Prenj and Cvrsnica are more than 2,000 meters above the sea level and they represent a real challenge for many hikers and lovers of adrenaline sports, mountaineering, mountain biking etc. Many travelers noticed something that makes Jablanica different from other parts of BiH and they especially emphasized extraordinary natural beauty, generosity, and hospitality of the population, as well as Herzegovinian houses made of stone. Moreover, Jablanica also has many cultural and historical monuments that the Commission to Preserve National Monuments declared as national monuments, including the complex “Battle on Neretva” with a museum and four stecak necropolis. One of them, a necropolis with 150 stecak tombstones Dugo polje in Blidinje, is on the list of World Heritage by UNESCO since last year. The memorial complex “Battle on Neretva” was famous and most visited destinations of many citizens of former Yugoslavia and Europe before the war. What makes Jablanica recognizable in the world is the Battle for the wounded, to which this complex is dedicated, and its most attractive exhibit is “Destroyed Bridge”, which will be reconstructed soon through the cooperation of the Municipality of Jablanica and Elektroprivreda BiH. This destination is visited by around 15,000 registered guests on an annual basis, while the number of unregistered guests is even higher. This fact shows that it is worth to pay attention to this institution in order to exploit this resource properly in the future period.